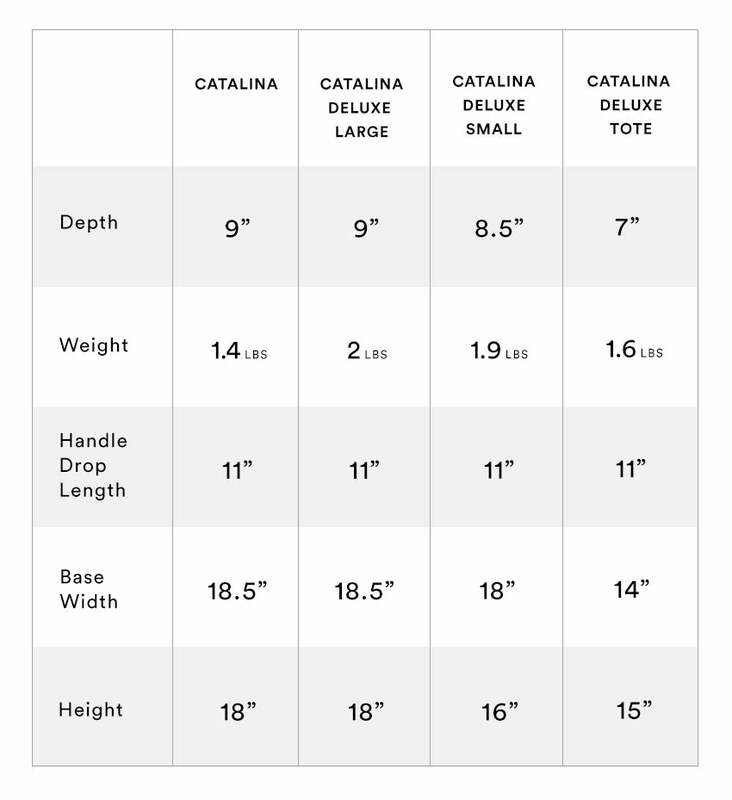 This is a guide to help compare the 4 bags in our line of Catalina bags. 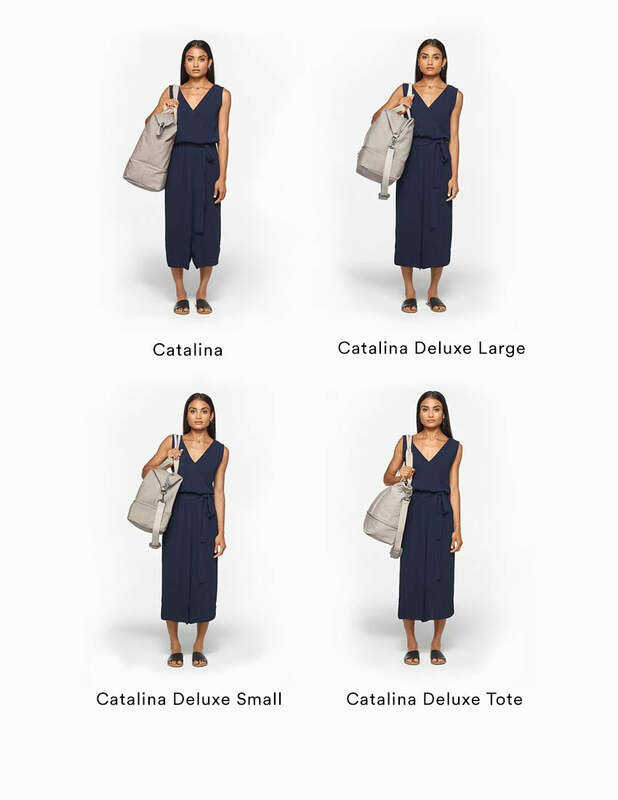 To help compare the different styles and sizes of our weekender bag, we asked two women of different heights to carry all four bags. 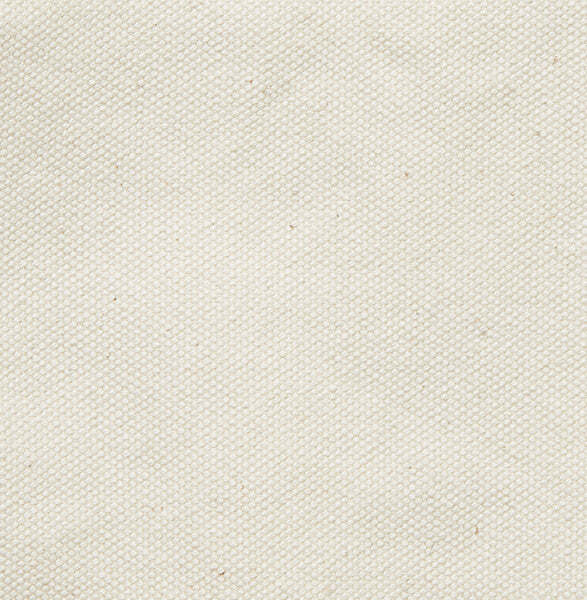 We use a high-quality, lightweight, yet strong pre-washed canvas. 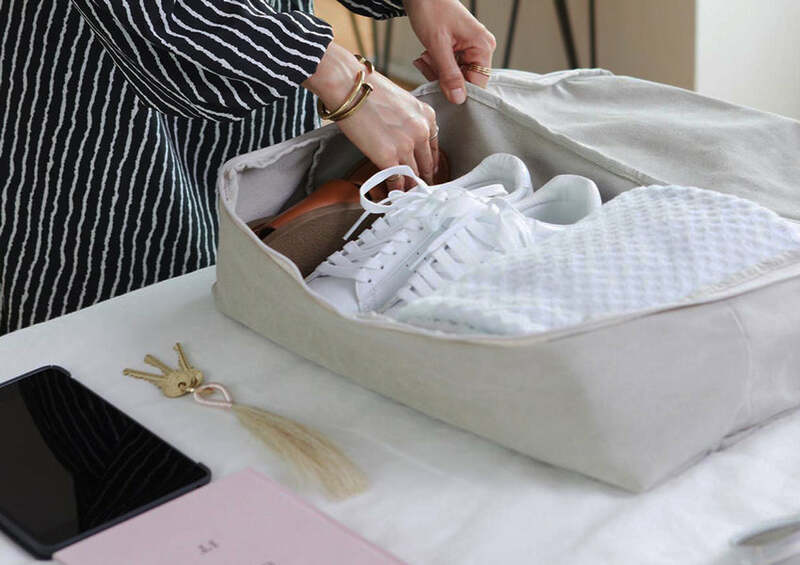 Despite being a softer and less structured canvas than the typical heavy canvas, it can handle a heavyweight load (even though we always encourage packing light). The material is so natural that you can actually see bits of the seeds on the surface! 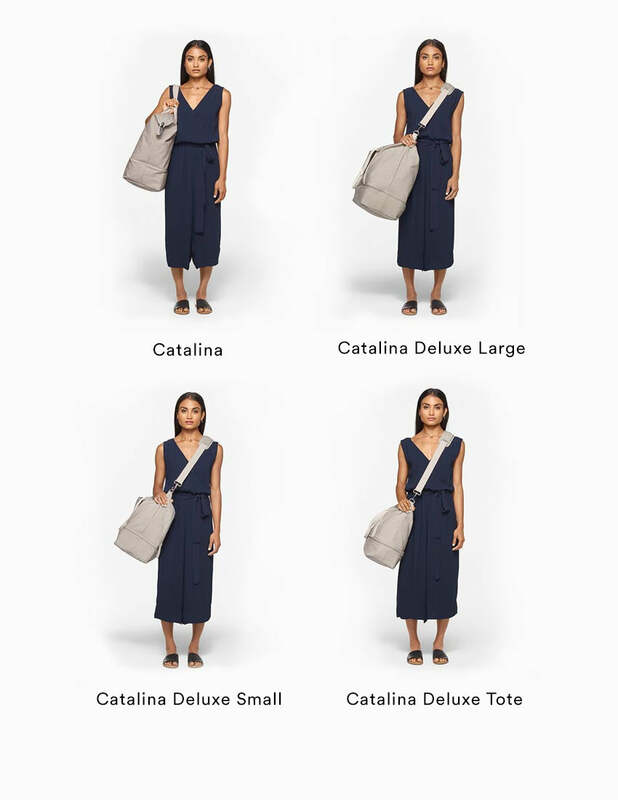 How do the “Deluxe” bags differ from the classic Catalina style? 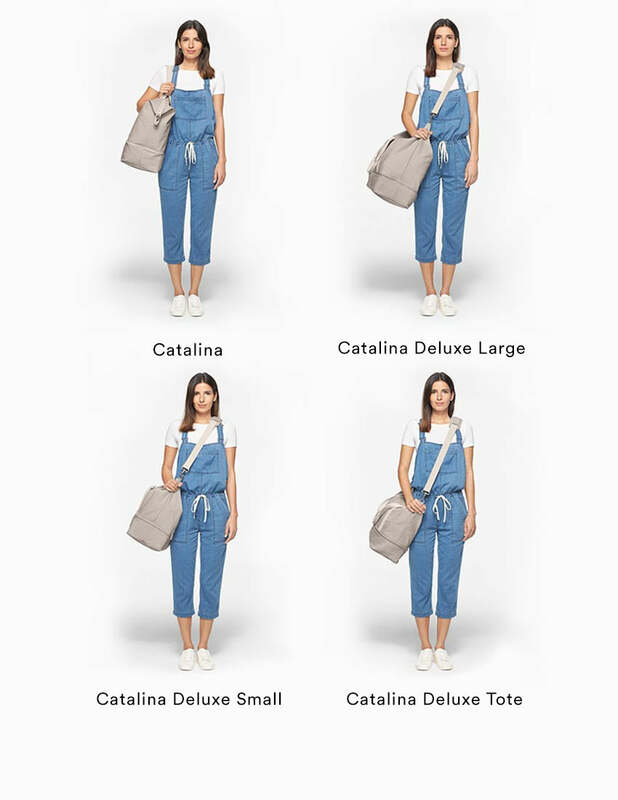 The features: The Catalina Deluxe weekenders (both small & large) include a bottom pocket padded insert, a suitcase handle sleeve, and messenger strap. 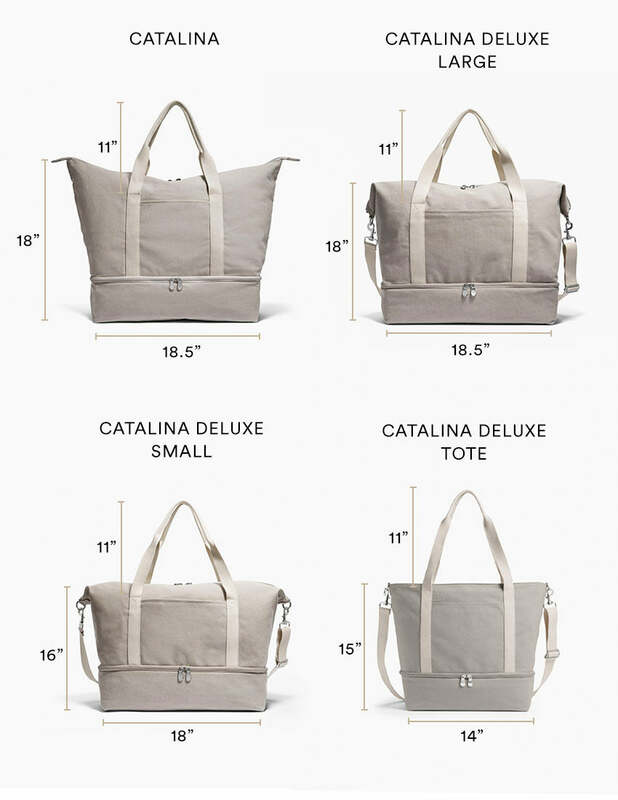 The Catalina Deluxe Tote includes all features, as well as an interior key leash and an adjustable bottom pocket. 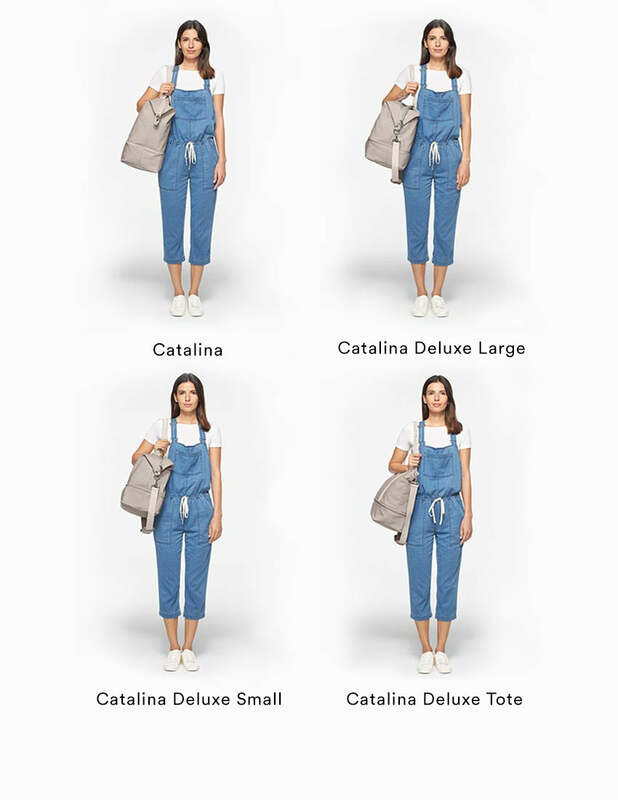 The classic Catalina does not include these features. The colorways: The classic Catalina is available in all colorways, plus additional colorblock options. 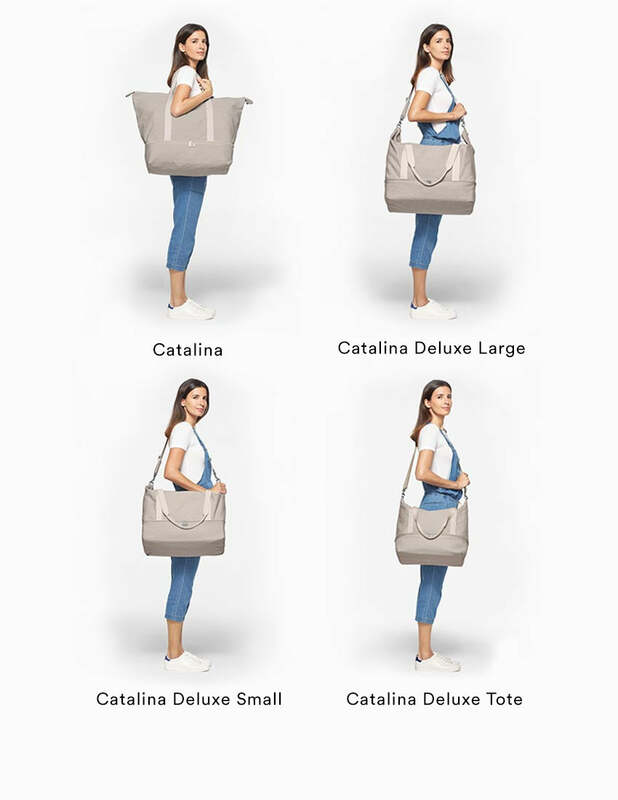 So which Catalina bags have a bottom pocket padded tray? 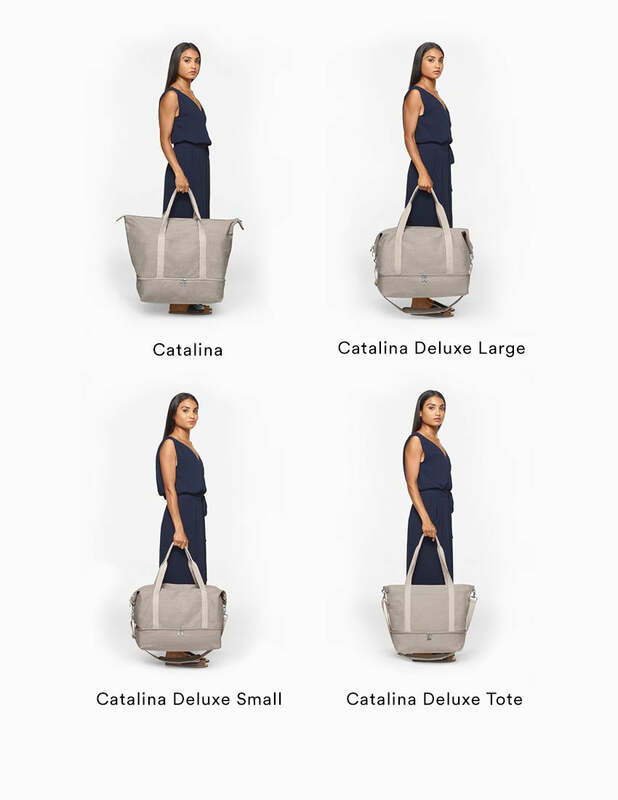 The Catalina Deluxe Large, the Catalina Deluxe Small, and the Catalina Deluxe Tote. 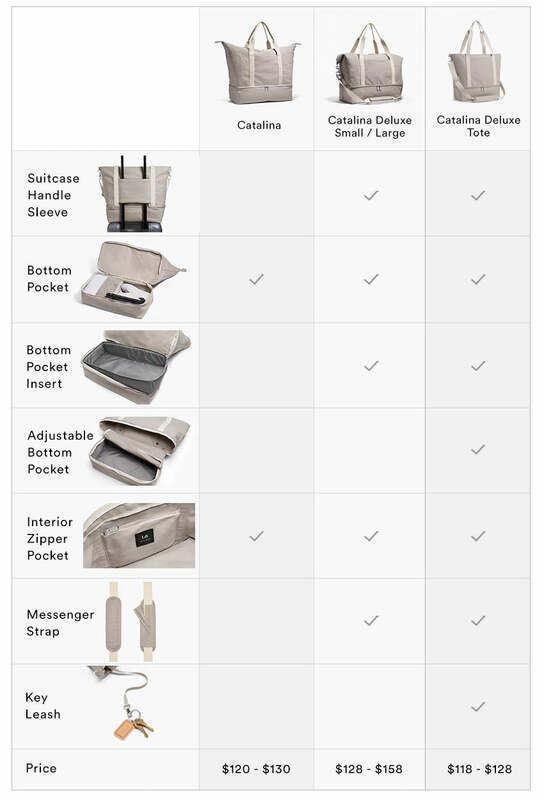 And which Catalina bags have the messenger strap and luggage sleeve? And is the key leash a feature on all the Catalinas as well? No. 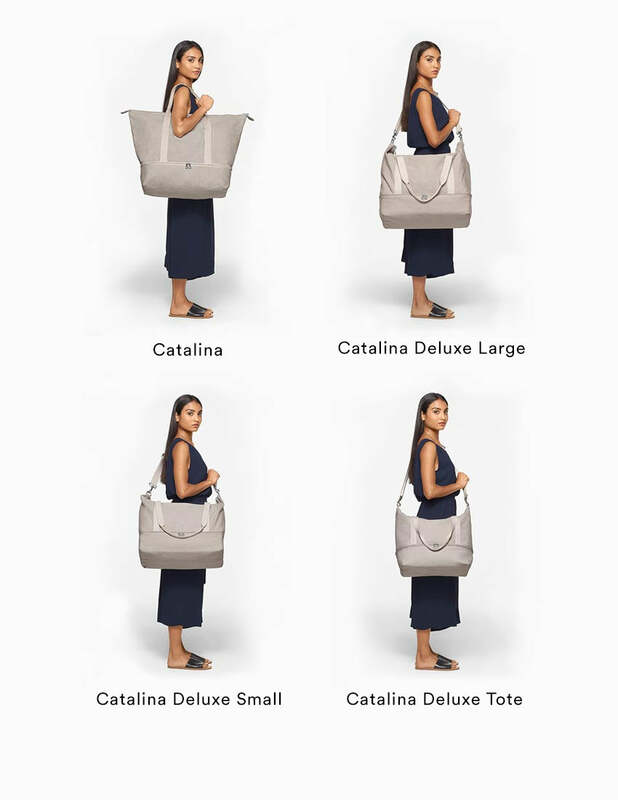 The key leash is an exclusive feature for the Catalina Deluxe Tote. This also goes for the adjustable bottom pocket! How do I clean / care for the material? 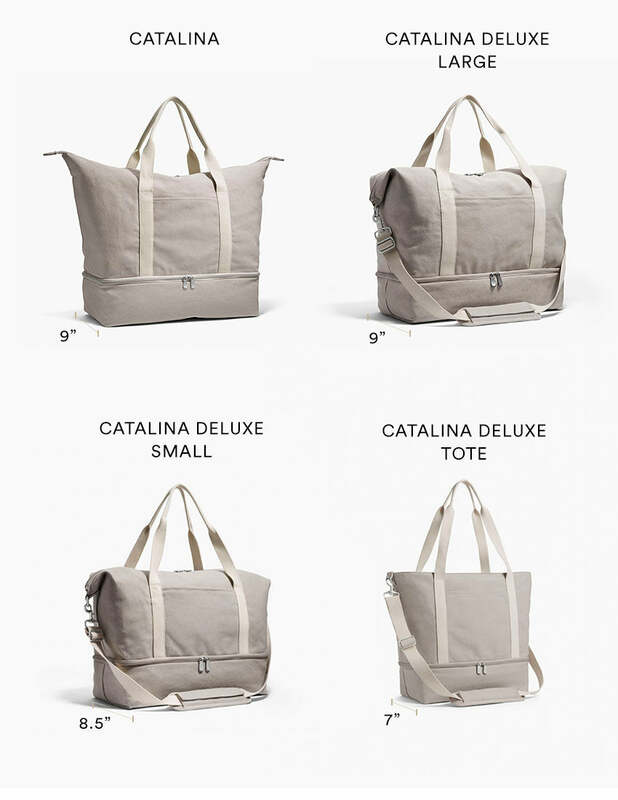 The Catalina bags are made from soft but sturdy pre-washed cotton canvas material. 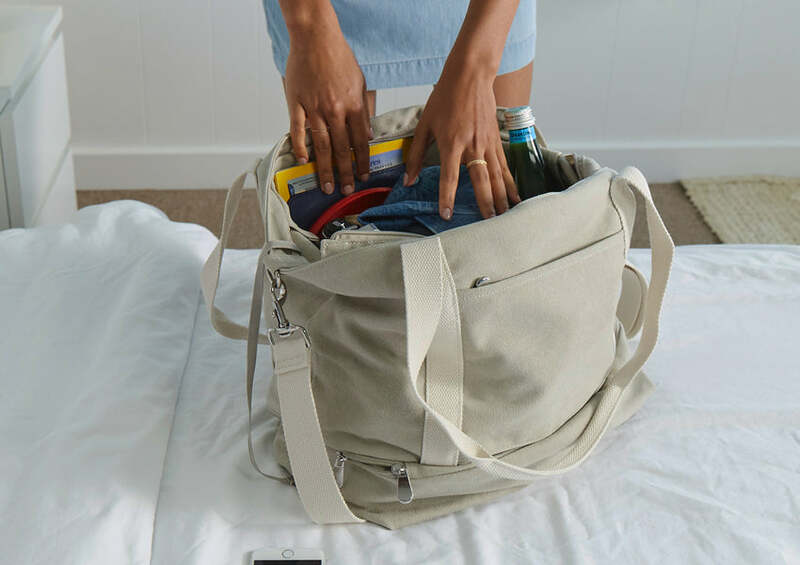 If needed, we recommend spot cleaning the bag with water or a mild soap, and then allow to air dry. However, test a small area of the bag with the mild soap first before applying all over to avoid any possible damage. 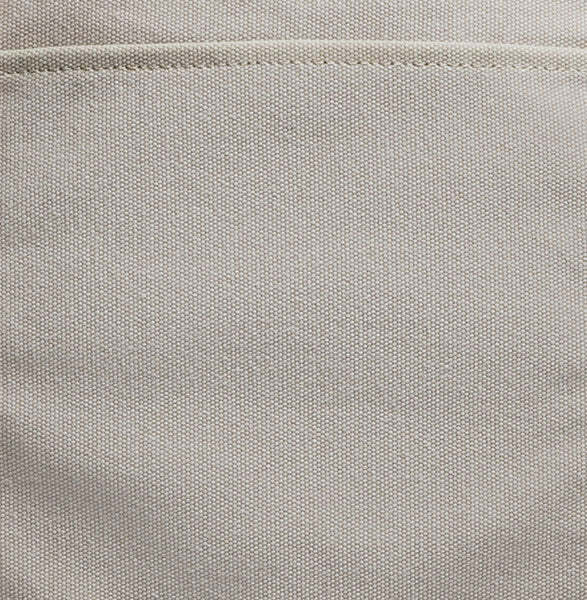 Some customers have machine washed the bag on the “delicate” or “hand washing” cycle with cold water and mild detergent, then laid flat to air or line dry. This method may cause minor discoloration for some colorways. 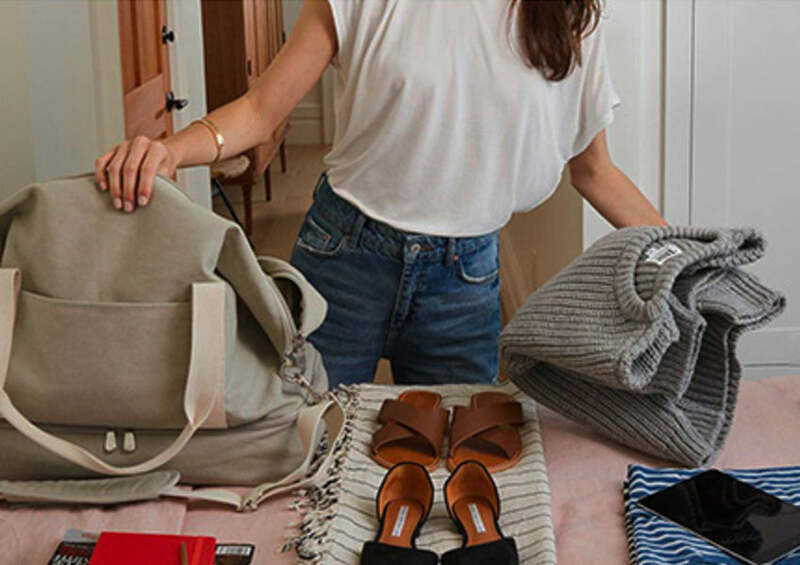 We DO NOT recommend taking the bag to the dry cleaners. 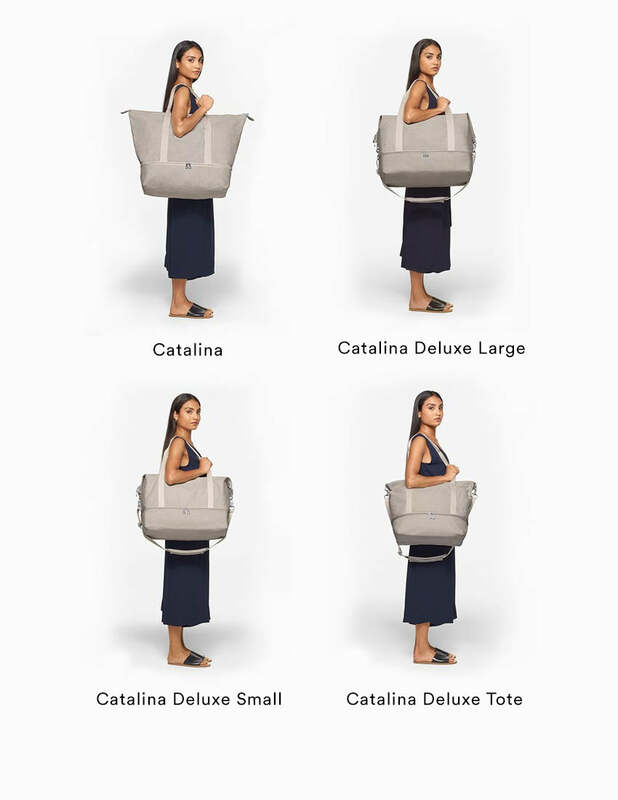 Does the Catalina Collection meet airline size requirements for carry-on bags? In general, yes. It is always a good idea to confirm carry-on requirements with your airline beforehand. For most airlines: The Catalina weekender can be placed in the overhead compartment of most aircrafts. The Catalina Deluxe Large weekender can be placed in the overhead compartment of most aircrafts and is comparable in capacity to the Catalina. 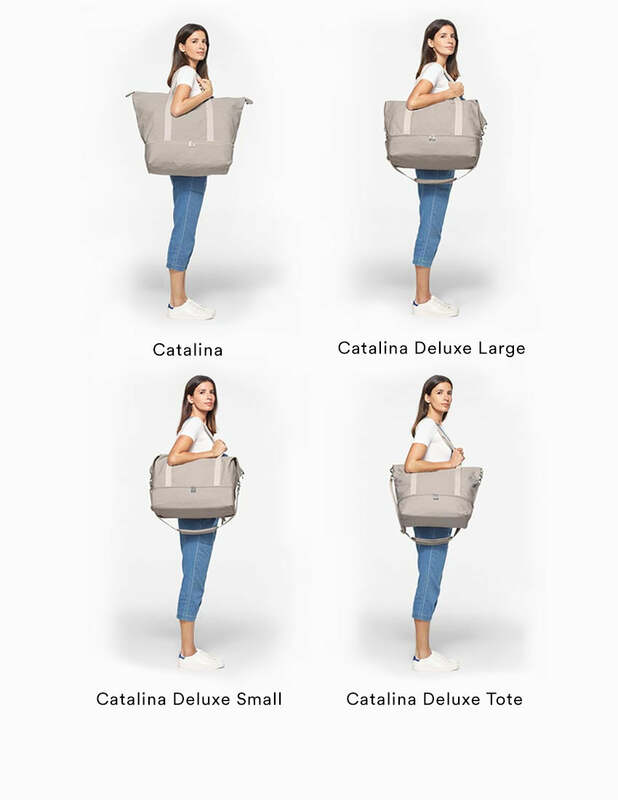 The Catalina Deluxe Small weekender can be placed in the overhead compartment of most aircrafts and may fit underneath the airline seat when not fully packed. 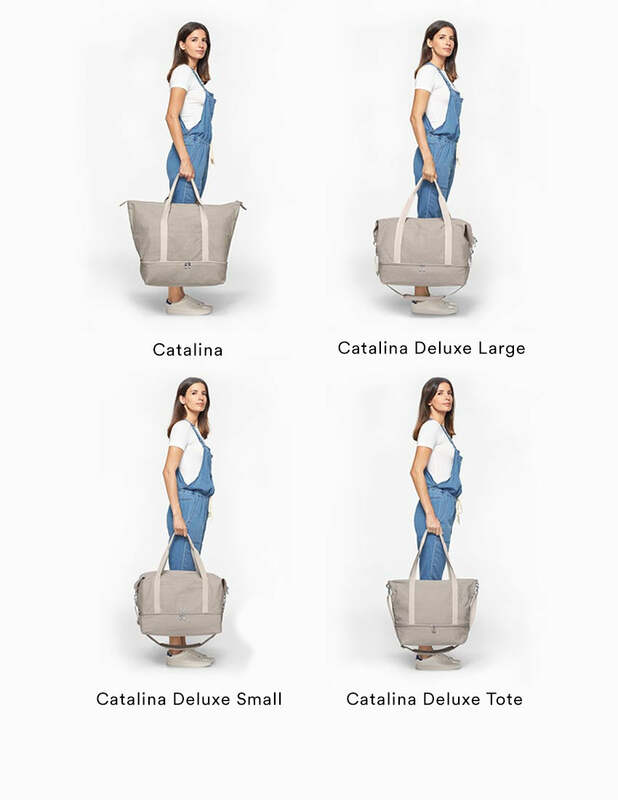 The Catalina Deluxe Tote should fit underneath the airline seat of most aircrafts, and should comply with the dimension requirements of most aircrafts. 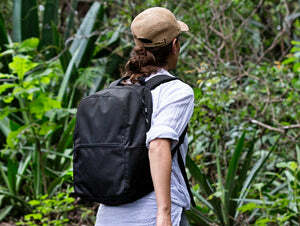 Keep in mind, due to the nature and material of the Catalinas, fit will vary based on how much is packed.